Gastrointestinal stromal tumors (GISTs) are the most common mesenchymal tumors of the gastrointestinal tract. Rectal localization is rare. The gold standard for treat-ment is: surgery and tyrosine kinase inhibitors (TKIs) for metastatic or unresectable disease. We report a case of a 62 year-old woman who underwent a gastroenterology visit for abdominal pain, tenesmus and constipation. After GIST diagnosis and staging, the pa-tient started induction therapy with imatinib followed by concomitant radio and tar-geted therapy before a sphincter-saving anterior resection, with a regular postopera-tive course. The rationale of neoadjuvant treatment is lesion downsizing for an easier surgery. In epithelial cancers treated through concomitant therapies, the goal is also to preserve the functional integrity of organs, lowering the risk for salvage therapies. Also in GISTs, there is a direct correlation between downsizing, downstaging and outcomes. 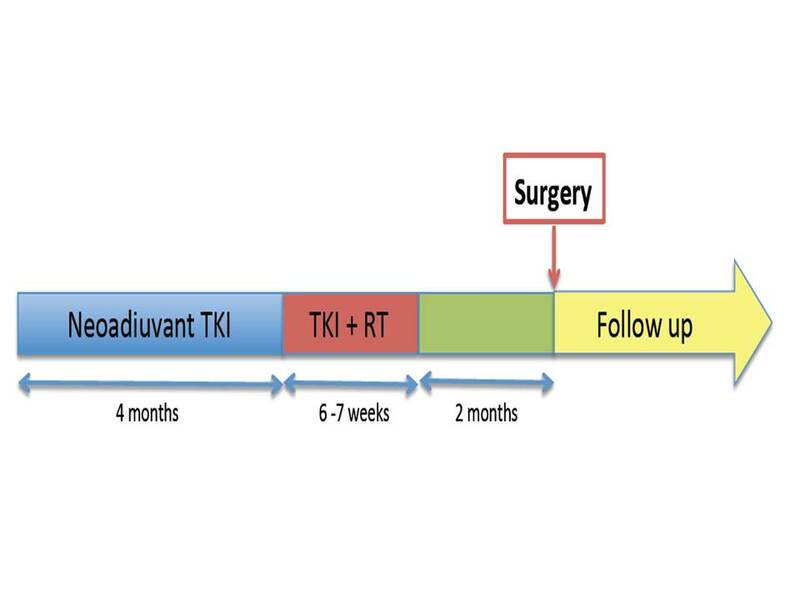 There are few reports about concurrent radiotherapy and TKIs, and this approach is probably underutilized. Further studies are needed. Rocco Luca Emanuele Liardo et al.